Dan Barvick, winemaker from Paradise Ridge Winery, is back on California Wine Country with Steve Jaxon and Dan Berger today. Paradise Ridge suffered extensive damage in the October 2017 fires and they are planning on rebuilding. They lost nearly everything in the fires but they still have the most spectacular view of Santa Rosa. L-R, Dan Berger and Dan Barvick. Dan Berger tells of his wine column today’s newspaper, the Santa Rosa Press Democrat, which is about acid and pH and what’s dry and not dry. He’s also writing a piece about Chardonnay, then after that one, an article about wine in cans. The Chardonnay piece is about what a winemaker needs to know to make one. There are so many inputs the winemaker can do. Great grapes make the difference, and he explains why good ones are expensive, first the grapes have to be really good, and second, from a small amount of grapes on that acreage. Then there is equipment and barrels. First they open a 2016 Ferrari Carano Chardonnay. Dan tells the story that Don Carano was a casino owner in Reno and he built a winery and Rhonda Carano, his wife, designed a garden there. It is a particularly beautiful property. Dan says this wine is old-fashioned, with some oak characteristics and tropical fruit component, with some pineapple and kiwi. Barry Herbst says that for years this wine was allocated but it now more available. Dan says this wine should be opened in about 2 years, when the flavors of fruit and tropical top notes will be at their best. Steve asks Dan Barvick to talk about their plans since the fires that destroyed the winery. Dan says they are definitely in the process of rebuilding. They lost all the wine from 2017 and most of it from 2016. 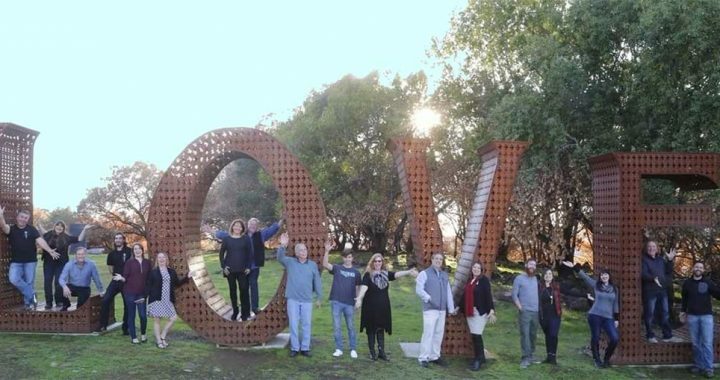 The winery has a lot of sculptures in the garden and their giant LOVE sign survived. Dan Berber notes that Dan Barvick has been working a lot with colder climate varieties in the Russian River Valley. Dan Barvick worked at Harrod’s in London, in the wine department, in the last ’70s and early ’80s. He worked in the food halls there. 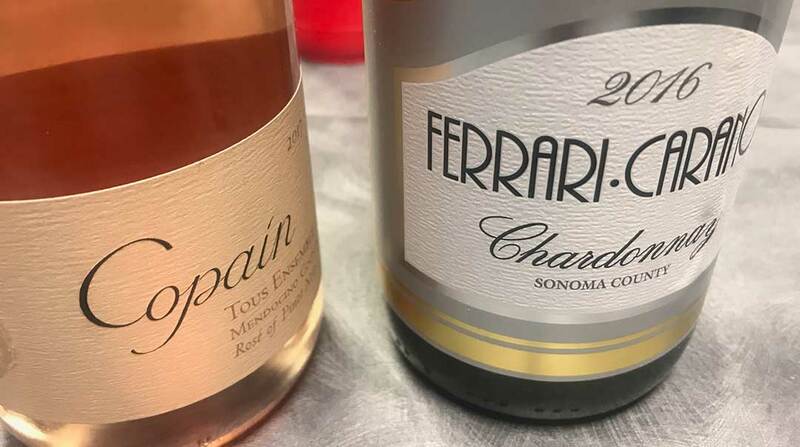 He studied winemaking, taking some classes at UC Davis and has taken viticulture courses at SRJC (Santa Rosa Junior College) and from Rich Thomas at UC Davis. Then they taste the Copain Rosé. Barry Herbst says that Copain has been a small operation for a while. The wine is pretty dry, maybe only 4 grams of residual sugar, but it has some undertones of red fruit in the aftertaste. Next they taste a wine that Dan has never tasted. Dan Barvick says it’s the only white grape grown in that AVA, which turns out to be a Grenache Blanc, a Paradise Ridge 2017 bottling. It has stone fruit flavors, according to Dan Barvick. He find that its keen acidity is characteristic of the growing area. He only made about 150 cases. Dan says the acidity allows you to appreciate the profile of its minerality. It has only 13% alcohol and they say it would go with seafoods. Dan Barvick says that July 2019 is their goal to reopen the winery. In the meantime he will be making wine in several other places. Paradise Ridge makes many different varietals, maybe 20, says Dan Barvick. Dan Berger notes that it is the closest winery to Santa Rosa and that they could be there in 10 minutes. He was born in Dover, England, and he says that chalky soil there is the same as the geologic formation in Champagne, so they are growing champagne grapes in Dover and Dan Berger says those sparkling wines are excellent. Dan says that Paradise Ridge’s Sauvignon Blanc is their best, but starting in about 2005 or 2006, something happened and their wines started winning competitions. He took 5 years to understand the vineyard and he thinks that the vineyards evolved and he improved as a winemaker, at the same time. Dan says the tannins are not aggressive but the acid is high enough so that you know that you can age the wine. Dan Berger remembers a Pinot Noir that Dan Barvick made about two years ago, a 2012 Walter’s Vineyard Pinot Noir. The vineyard is still young and now it is showing what it can do. It has a unique microclimate and some volcanic soil, sandy loam and good drainage. It can be colder at 10:00am than at 8:00, due to the fog. Paradise Ridge lost its wine collection in the fire too. So for the foreseeable future, Dan Barvick will be making Paradise Ridge wine in other facilities. 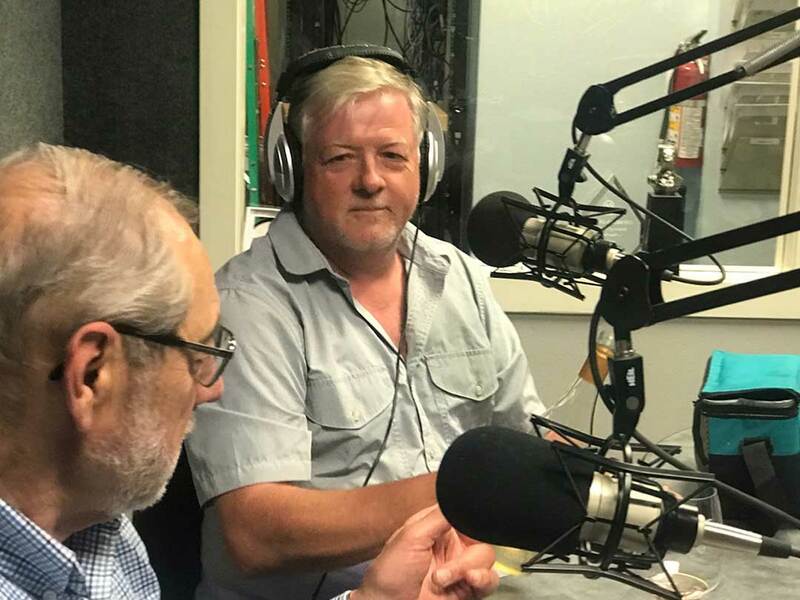 Since today’s show was made a half-hour early to allow the Golden State Warrior’s game to be broadcast on our home station KSRO in Santa Rosa, they talk a little about basketball and cricket. Barry tells that the Bottle Barn Rosé tasting on July 21 is sold out but there will be free tickets given away on their social media. They are also planning other tasting events too.